Bad posture is one of the leading causes of back pain in most people. Most people suffer from back pain at some point in their lives. The pain may be severe but it is usually not serious, and it lasts for a few days. It is important to rest the feet on the floor when one is seating. In cases where the foot does not reach the floor, one can use a footrest, and this allows one to assume a comfortable position. It is important to avoid crossing the legs as this can lead to other problems that are linked to posture. Place the keyboard in front when typing to leave enough space for resting the wrists between bouts of rest. It is advisable to leave a space of 4-6 inches approximately. Keep the wrists in a straight position when using the keyboard. Keep the elbows in a vertical position on the side and under the shoulder. It is also advisable to use a wrist rest to keep the wrists straight and at the same level as the keys. The chairs that one uses at the workstation should be stable, and this is because one spends many hours at the workstation. The standard office chair has five legs, and they are usually in a star shape. The height of the seat should be adjustable. The backrest should also be adjustable in tilt and height. The backrest should be able to move independently of the seat, and this is in order to allow a comfortable position. It is important to seat upright with the support of the small area at the back. The feet should be placed flat on the floor, and the hips and knees should be level. It is also advisable to use a rolled up towel or a small cushion to support the back in places where one is feeling uncomfortable. In cases where one works on a computer all day long, it is advisable to make sure that the forearms are at a horizontal while the elbows are at a right angle. It is important to position the mouse as close as possible when working. A mouse mat that has a wrist pad will help to keep the wrist straight, and this will avoid awkward bending. When the keyboard is not in use, push it to one side and keep the mouse near. It is also advisable to place the screen at the eye level to avoid straining when working. The best guide when using a screen is to place the monitor at an arm’s length away with the top roughly at the eye level. To achieve this position, one may need to get a stand for the monitor. In case where the screen is too low or too high, one will have to bend the neck, and this is likely to cause severe back pains. Keep the objects that are in frequent use in a place that is accessible or within easy reach. This includes the telephone, writing pad, pen, stapler, paper punch and other things that are in frequent use. It is important to avoid repeated twisting and stretching to reach things. It is important for people who spend most of their office hours over the phone to try and exchange the handset for a headset. Repeated cradling of the phone between the shoulder and the ear can strain the muscles in the neck. 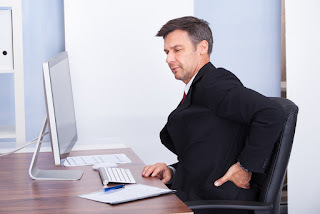 Most people who use the phones for long hours slouch without realizing the damage they are causing to their backs. It is important to maintain the right sitting position when working and when one is at home. It is advisable to break the long periods of working with stretching exercises to help prevent the occurrence of back pain. The practice of good and proper posture will aid in maintaining the natural curves of the back and keep it strong. The major cause of back pain is an improper posture especially at the workstations where one spends most hours of the day. Sophie Addison is a popular blogger and writer on beauty and general health related topics. She is very passionate about health and beauty. She has posted articles on skin care tips, weight loss and fitness. Apart from work she likes gardening and listening music. You can also contact her on Facebook, and Pinterest. Agree. Sitting postures can really leads to severe back problems.Thanks for raising the concern here and disclosing the correct posture of sitting. Cheers.